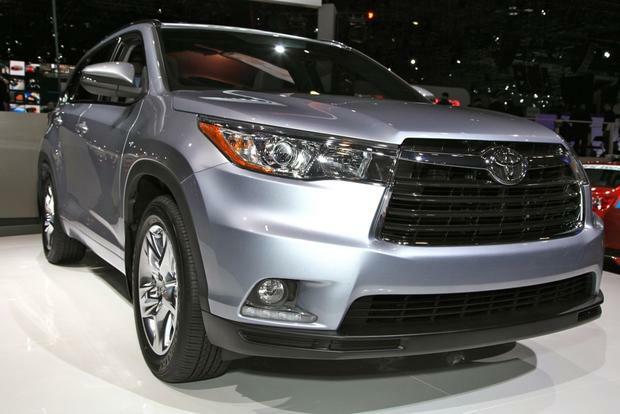 The eight-passenger 2014 Toyota Highlander is an all-new version of Toyota’s popular midsize crossover SUV. Although the current Highlander has continued to be a strong seller for Toyota, it was due for a redesign, and here it is, just in time for the bright lights of the 2013 New York Auto Show. Sharpened and creased much like the recently introduced 2013 Rav4 , the 2014 Highlander looks unmistakably modern, and that goes for the roomier, completely overhauled interior as well. Under the hood, though, the new Highlander largely retains the outgoing model’s powertrain. Pricing likely won’t be announced until later this year, but the current Highlander ranges from about $30,000 to $40,000, and we expect the 2014 Highlander to stay the course for the most part, leaving higher price brackets to the premium Lexus RX. The all-new 2014 Highlander should arrive in Toyota dealerships early in 2014. The 2014 Toyota Highlander adopts contemporary styling and technology, as well as a larger third-row seat and cargo area, while otherwise retaining the outgoing model’s successful formula. Outside, fresh angles and curves announce the 2014 Highlander’s “newness,” creating obvious separation from the 2013 Highlander’s more restrained shape. The cabin, meanwhile, is a quantum leap forward, offering upgraded materials and neat tech features like an 8-inch touchscreen navigation system and a 4.2-inch “Multi-Information Display” for the driver. There’s big news in the way-back, too, where the third-row seat with reclining seatbacks is over four inches wider than before. Toyota says it can now accommodate up to three passengers without issue, in contrast to the previous Highlander’s rather cramped two-person third row. Credit largely goes to a more compact rear suspension design that frees up passenger space and also increases cargo capacity. Under the hood, the 2014 Highlander employs basically the same 2.7-liter 4-cylinder and 3.5-liter V6 engines as before, along with the familiar Hybrid powertrain based on that 3.5-liter V6. However, the regular V6 model’s 6-speed automatic transmission has been revised to improve fuel economy.